With some of the finest sailing in the world, settled protected anchorages and enchanted underwater treasures, the British Virgin Islands are a sailor’s paradise. The steady trade winds offer favorable sailing conditions, while the line of sight navigation and calm shimmering waters makes sailing or motoring a pleasurable and invigorating experience. 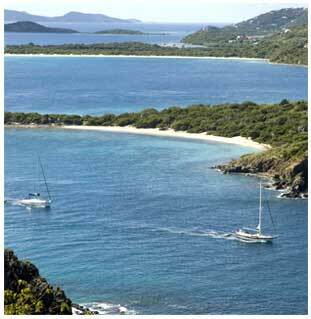 BVI boating holidays, yacht charters and sailing vacations are widely regarded as the premier choice for caribbean yacht charter. With easy line of sight navigation, favourable weather conditions, fabulous fishing and abundant marine life sailing the BVI has become more and more popular over the last 10 years. The British Virgin Islands have the largest selection of bareboat, skippered, crewed & superyacht charters in all of the caribbean. The many yacht charter providers have extensive fleets of monohull, catamaran, powerboats and luxury yachts. We can assist you on finding the right boat with the right company that matches all of your requirements to ensure that your sailing vacation in the Virgin Islands meets all your expectations. The British Virgin Islands beautiful archipelago consists of over 60 scattered islands, cays and rocks. Located in the Northeastern Caribbean, only 100 miles east of Puerto Rico, the BVI territory is 32 miles long and 15 miles wide. 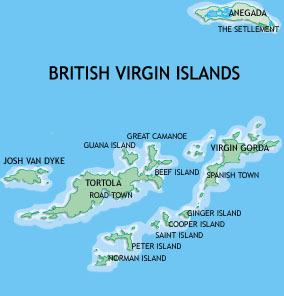 Around 15 of the islands are inhabited with the main islands being Tortola, Virgin Gorda, Anegada and Jost Van Dyke. Christopher Columbus discovered these islands in 1493 and named them after Saint Ursula and her 11,000 Virginal Handmaidens. (There were not 11,000 martyrs but 11, and when originally written as 11M it was misinterpreted as a roman numeral). The British Virgin Islands are a natural beauty with exuberant vegetation and glistening clear waters. The pristine white sandy beaches outlined with shades of liquid blue gives these islands a magical, exotic feeling. With forts and church ruins dating from the 1800’s a clear display of British and Dutch cultural history can be seen. 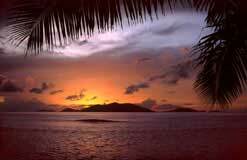 The BVI have a varied and intriguing environment with dramatic volcanic mountainous peaks rising 1780 feet above sea level and sheer rock faces that plunge down to the ocean beds. With 4 acres of Botanical Gardens, 20 National parks including marine, bird and tropical forests, a museum, plenty of bars, restaurants and a fabulous sailing conditions, all contribute to the British Virgin Islands being a desirable cruising and holiday destination. With some of the finest sailing ground in the world, settled protected anchorages and enchanted underwater treasures, the British Virgin Islands are a sailor’s paradise. The steady trade winds offer favorable sailing conditions, while the line of sight navigation and calm shimmering waters makes sailing or motoring a pleasurable and invigorating experience. Unwind and relax as you lie on your trampoline or deck, soaking up the tropical warm sun shine and listening to the gentle waves lapping at the hull. Diving off your yacht into the cool turquoise water you will find an underwater marine haven waiting to be explored. Horseshoe reef is approximately 17 miles long and is the third largest reef in the world. Located around Anegada Island the reef is a divers and snorkelers dream. The reefs found all over the BVI have fascinating formations and as you float peacefully over them, you will be dazzled by the bright kaleidoscope of colours. Weaving in and out of the corals you will see parrot fish, trumpet fish, groupers, angelfish and many more. Hawks bill turtles and rays gracefully swim in these waters and lobsters can be found hiding amongst the coral rock. If you are a diver then you will love the spectacular site of the R.M.S. Rhone, shipwrecked off Black Rock Point by a hurricane on 29th October 1867. Claiming 124 lives the ship exploded into two and now rests on the sea bed in two locations, one at 30feet and the other at 90feet. The RMS Rhone wreck is known for being the best dive site in the Caribbean. The British Virgin Islands are enchanted by simple pleasures, stunningly beautiful islands and endless coral reefs. The local people are very friendly, laid back and always willing to share a story and a drink with you. Beach bars are a great place to sit in the shade and sip a refreshing drink while you listen to the Caribbean rhythms of a steel band. At sunset take a stroll down the powdery white beach and let the gentle waves carry your normal hectic lifestyle and worries far out to sea.